The Spartan I’m reviewing today is somewhat unusual. 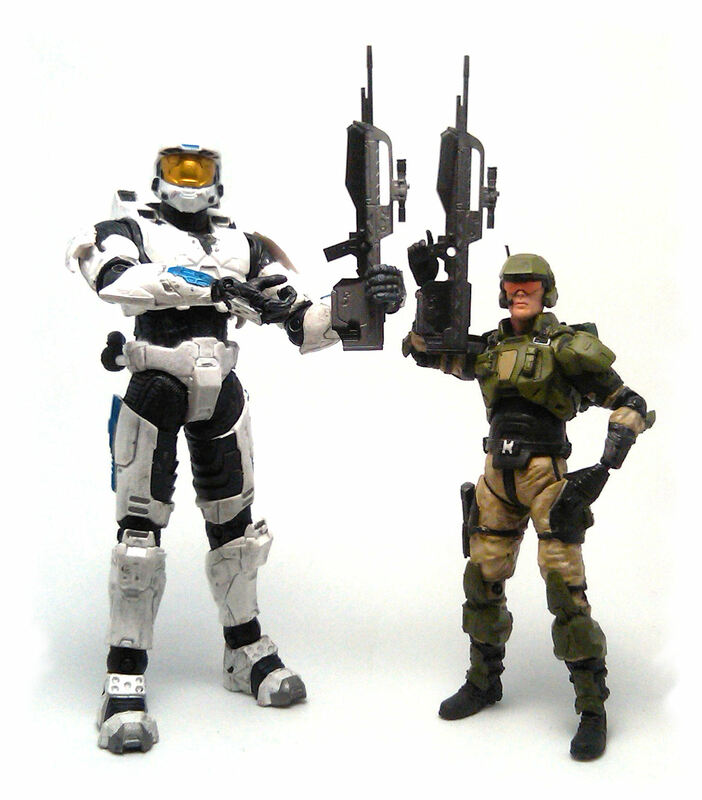 You’ll see, when McFarlane Toys started doing figures for the Halo: Reach game, they changed the scale slightly, so all of the figures they had released previously for Halo 3 ended up being shorter than the new ones. 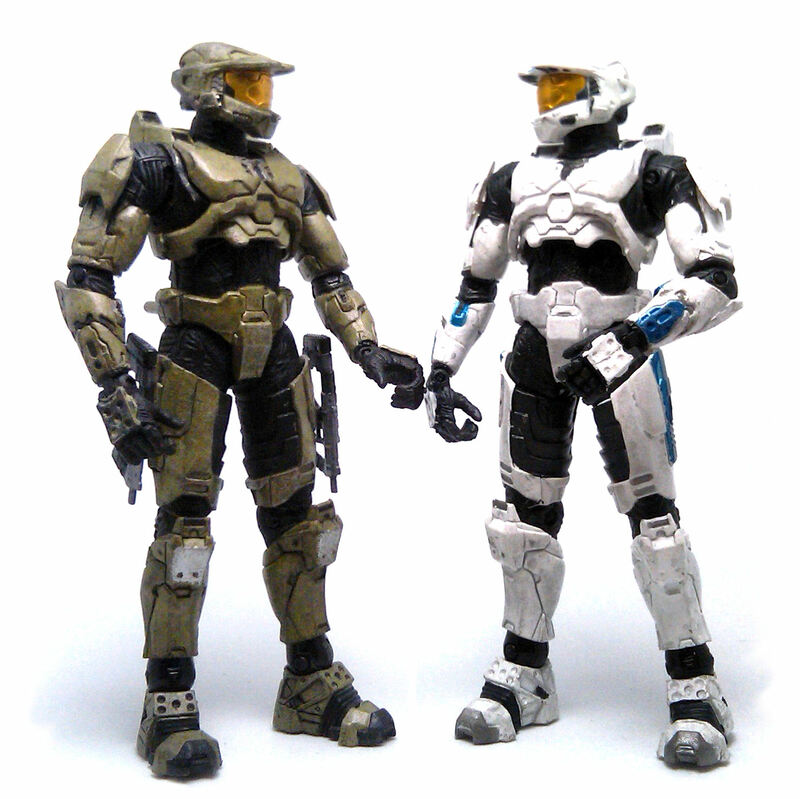 However, back when the Halo franchise had their tenth anniversary, McFarlane developed new Spartan VI molds adjusted to go with the Reach scale, offering them first as part of a three-pack showing the evolution of the Master Chief character over the first three Halo games. The Spartan Mk. 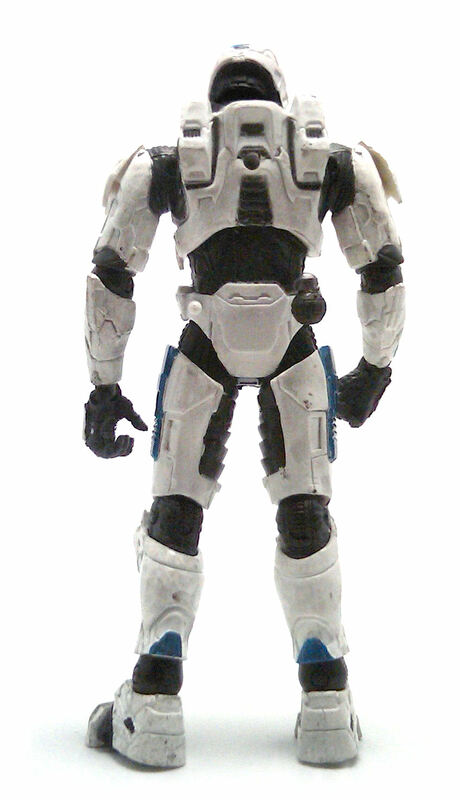 VI I’m reviewing today uses the exact same mold as the Halo 2 Master Chief figure from that set, but comes from the second series of the X Anniversary line and it is meant to represent a multiplayer Spartan, not the Master Chief, hence the vastly different white and blue coloring. The sculpture is almost the same as the Halo 3 Master Chief, only blown out 110% in size, and it still shows a pretty good level of detail. There were a few changes done to the wrist and hip articulation design to incorporate a design similar to the one used for the Halo: Reach Spartans, which is actually an improvement over the older implementation. The hips may not have as good a range of movement as the older style hips, but look much better and still provide a good amount of poses. The wrists are much sturdier design and are actually more versatile than the simple ball joints they used to have. The color scheme on this Spartan is simple yet effective. 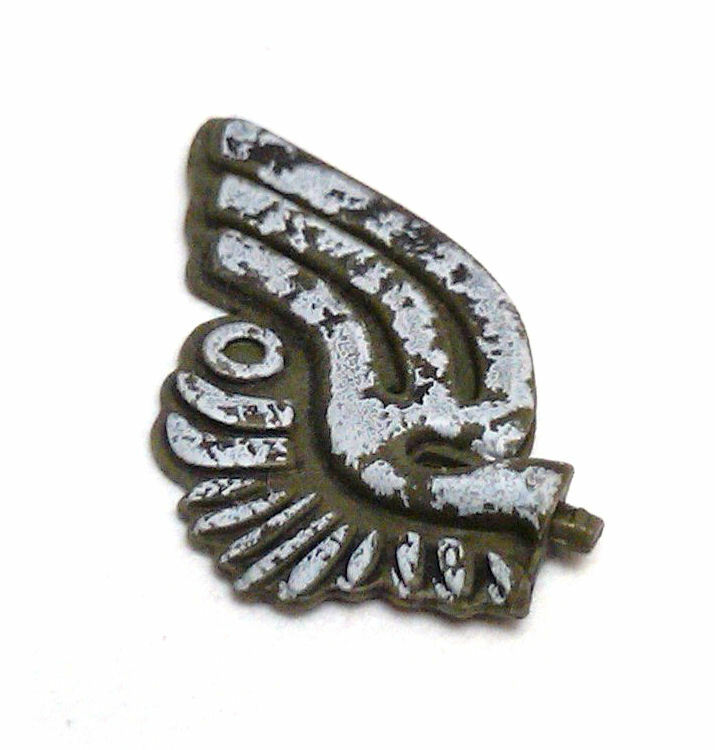 The armor received a very light shading wash to bring out the sculpted lines and panels, yet the look is still quite clean and no simulated wear was given to the figure. The blue accents are neatly applied and complement perfectly the rich gold visor on the helmet. The white Mk. VI comes armed with a fragmentation grenade and a Halo 3 Battle Rifle. 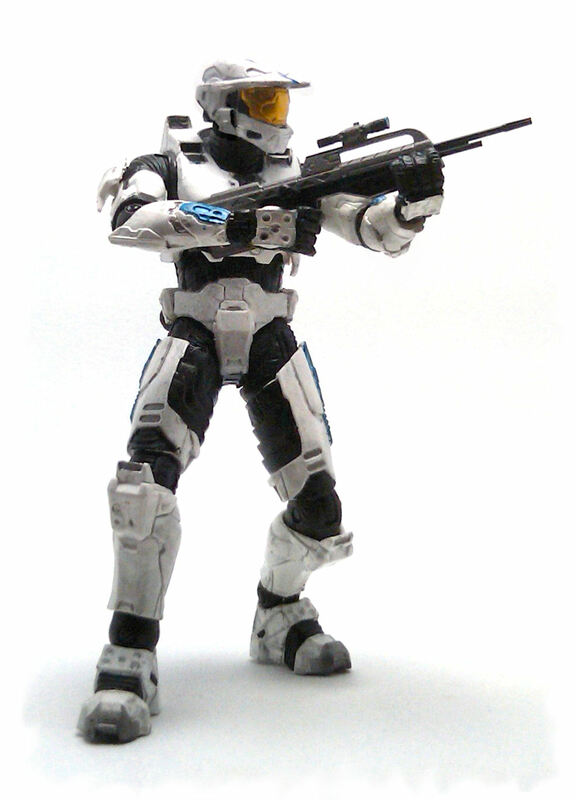 The rifle is the exact same mold and scale of the old Halo 3 line, which is something of a disappointment because the weapon is too small and doesn’t fit snugly in the Spartan’s hands, although it is decently decorated. In addition to the weapons, the Spartan also comes with a piece to build the UNSC icon, McFarlane’s take on the Build- A-Something gimmick. So far, I must confess that the extra piece has not been much of an incentive for me to pick up these figures, but then again, I might end up completing the thing anyways. In the end, the Spartan Mk. 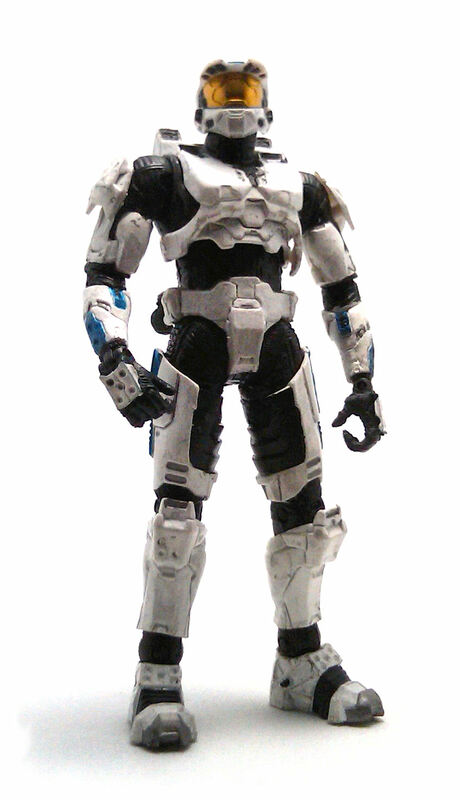 VI is a pretty neat figure to have, although not necessarily a must-buy if you are not a Halo fan.